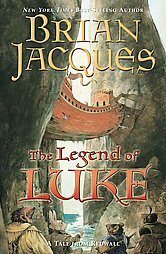 This here’s the sequel to His Majesty’s Dragon (which, it seems, has also been released under the title Temeraire), and the second in an ever-expanding series. 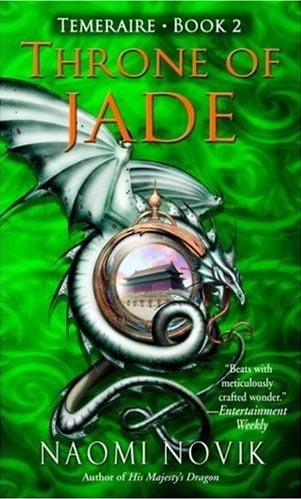 In Throne of Jade, the dragon Temeraire and his crew travel to China to uncover his mysterious origins. Grand adventure and page-turning intrigue ensue. Unfortunately, ToJ is not as good as its predecessor. Part of what I liked about HMD was the novelty of historic fiction being interwoven with draconic fantasy. While this book has a lot good features … it’s like the second seaon of Lost. It’s still good, but the freshness has faded and you worry that it’s only downhill from here. Hopefully, the series will pull a 24 (season 4) and rebound into excellecy, instead of flailing incoherently into obscurity, a la The X-files. I guess I will just have to read and see, after a short break. Oh, silly little mysteries. This Maggody series is the epitome of the silly little mystery, but it isn’t a very good story in general. I’m not sure what it is about the books that rubs me the wrong way, but reading each new entry is more like a chore than a treat. At least it’s a fast read. The Maggody series is about a small town, Maggody, which is policed by a woman from the big city. She grew up in town, married and moved to New York, then returned when her marriage fell apart. Her mother got her the job of chief of police for the town (not a great honor since there is only one policewoman in the station) and she spends her time alternately dreaming of getting away and half heartedly chasing whatever bad guy presents himself. She also must deal with the characters in town, not the least of which is her overbearing and bar-owning mother. Muletrain to Maggody is unmemorable, really. A civil war reenactment descends on the town, and our heroin must deal with the craziness of the participants, while investigating a suspicious death that may or may not have to do with hidden gold. Of course various members of the community must stick their noses into the business and the good chief has to work everything out. I’m not sure what it is that makes this series so mediocre…perhaps the lack of unique characters or the utterly predictable plot. Whatever the problem, these books have yet to grip me in a way that makes me look forward to the next sequel.